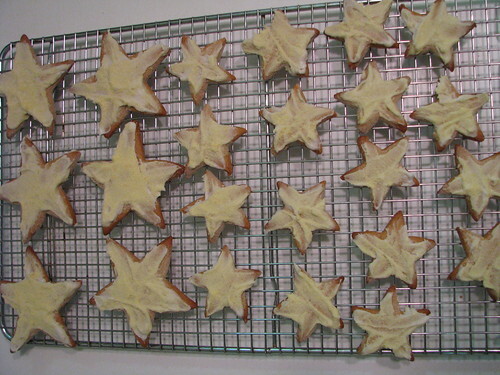 Holiday star cookies, originally uploaded by almostgold. Starting in on the frosted+sugared cookies now. In a large bowl, cream vegetable shortening, sugar, egg, honey, and lemon extract until light and fluffy. Sift in flour, baking soda, and salt; stir until well blended. Refrigerate dough at least 1 hour. Bake 8-10 minutes. Ice with your favorite royal icing technique. I like to slather them in frosting then cover them with colored sugar. Next PostNext Great Wines Delivered to Your Door — That’s Progress!